THE EU APPROACH TO THE WESTERN BALKANS: A SECURITY OR POLITICAL ISSUE? This paper will focus on the policies developed by the European Union towards the Western Balkans, especially those related to human mobility and visa liberalization. The main target of the paper will be to show how the conditionality policies towards these countries have been developed related to security, geopolitical needs and interests, instead of the objective/technical criteria stated in the communitarian official documents. We will see how the last enlargements of the Union have affected considerably the different positions adopted by member states in their approach toward the Balkan countries, especially in relation to chapters 23 and 24 of the negotiation agreements, dealing with issues of Justice and Home Affairs. Since then, the pragmatic approach of the Union has been reinforced, so that the accession of candidates has been delayed in time. However, some things might change, if we take into consideration the current refugee and Ukraine crises, the new relationships that have been developed with Russia (especially by Serbia), and Greece’s approach towards Moscow on the verge of the economic crisis. If the European Union has, until now, followed a stick-and-carrot approach towards the Balkans in order to maintain a security belt on its southeast border, this approach might change within a new geopolitical context. In this paper we will analyse the visa liberalization process and its developments since Thessaloniki 2003, to show how the decisions taken by the Union have been more linked to political matters related to security than to technical reasons related to passport design. Kosovo, like all EU members as well as those aspiring to join the EU, is fighting on different “fronts” aiming to attain EU and international standards. Among these standards, media freedom represents without any doubt one of the most difficult challenges as the country aspires to be democratic and transparent, as well as to respect human rights and fundamental freedoms. Having this in mind, the Kosovo Government is trying to accelerate the integration process by supporting the idea of free and transparent media as a precondition to EU membership. Such an objective has become an obligatory part of many documents deriving from the Kosovo constitution as well as other plans and strategies like the National Strategy for European Integration “Kosovo 2020”. In Kosovo’s integration process, there are several other obstacles, specifically with the opposition of some EU members to recognize the authority of the Republic of Kosovo, but with no doubt, media freedom is among the basic and fundamental ones. Thus, this paper attempts to present and analyse the approaches that the Kosovo institutions are using to improve the process of having a free, transparent and democratic media as an important component of the integration process and EU membership. This study seeks to bring a new understanding of Serbia’s European integration and the implications for its external policy in the context of the current geopolitical decisions taken in the region. The aim is to emphasize the complexity of the enlargement process, as well as the difficulties created by Kosovo’s decision to declare independence (2008). The first section focuses on the analysis of the consequences of ethnic and / or interstate conflicts from the ‘90s, in order to underline the importance of the wars for the disintegration of Yugoslavia in the accession process and their role in determining the further institutional steps of Serbia. The second section is dedicated to describing Serbia’s rapprochement with the EU and its future steps towards joining the organization. The main hypothesis is that Serbia’s accession process is no different from that of former candidates. Nevertheless, the weight of the wars for the disintegration of Yugoslavia and Kosovo’s decision will play an important role in the negotiation process. The last section is dedicated to a case study on Kosovo, the decision of declaring its independence still representing a source of diplomatic disputes between Serbia and the EU. In order to give a better understanding of the implications of this decision, an analysis of the main challenges is conducted within this section. The analysis focuses on several topics: the reaction of the five EU opponents to the decision, the future of the Albania-Kosovo relation, the reaction of the main EU institutions and the development of a “Kosovo precedent”. This paper opens up the black box of enlargement, focusing on how the intra-organizational relationships among the Council of the European Union, the European Commission, and the European Parliament affect the process of enlargement. Formally speaking, enlargement is an intergovernmental process, suggesting that member states are firmly in control of its outcomes. However, the EU’s supranational actors, specifically the European Parliament and European Commission also attempt to influence enlargement at various stages. I posit that the process of enlargement to the Western Balkans has evolved, influenced by changing constraints which are operating on the aforementioned actors. The added value of this work is in disaggregating the enlargement process based on its institutionalized relationships in both a vertical and horizontal dimension. It provides a supply-side argument for how enlargement policy has evolved from within the EU, rather than simply as a function of external factors. The Balkan region is still a “hot” zone where old legacies of the past interfere with the present and contribute to the transition processes of the countries there. The region seems committed to follow an EU-bound path, although it faces many challenges in terms of meeting the standards for EU and NATO membership. Somehow, persistent conflicts delay finding solutions. The difficult democratic transition, the lack of will and shallow political culture of regional elites delay the process of bringing these countries forward. This profound transition unfortunately occurs while the EU, on one hand, is trying to play the arbitrator part having promised to assume full leadership role and, on the other hand, tries to restrain the voices of those Euro-Sceptics who have been increasing their numbers recently. Meanwhile, a deterioration of the situation in the Balkans might have a negative impact across Europe and decrease the credibility of the EU as the main foreign policy and security actor in the whole region. This paper will first analyse the transition processes in the Balkans and the back and forth efforts to leave behind the past and head toward a common European perspective. Secondly, it will analyse the required active role of the EU and the urgency for a closer monitoring of the situation in this region. Thirdly, it emphasises the need to encourage public diplomacy in the region in order to mitigate conflicts and promote cooperation between the people there. The purpose of this article is to analyse the security environment at the beginning of the XXIst century and to assess the impact of EU conditionality in the Western Balkans. The paper will analyse the redistribution of power and the new challenges that send the European Union at a crossroad. To explain such complex phenomena, we will use a comprehensive framework based on realism, liberal institutionalism, and constructivism. The central part of the paper will analyse EU conditionality in the Western Balkans – along with its characteristics, particularities, difficulties – and the impact of the degree of sovereignty. The case-study will provide a comparative analysis between EU conditionality in Bosnia and Herzegovina and Bulgaria proving that sovereignty matters for the conditionality-compliance relationship. The appointment of a double-hatted High Representative of the Union for Foreign Affairs and Security Policy (HR) and the creation of the European External Action Service (EEAS) were two of the main innovations brought by the Lisbon Treaty to the European Union’s foreign policy. According to their mandates, the High Representative and the External Action Service aim to increase the consistency of the European Union’s external action thus answering to on-going criticisms about the lack of a “single voice”. 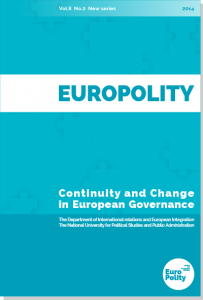 This paper aims to assess the policy implications of the main post-Lisbon institutional developments by using the concept of “coherence”. Understanding this concept as synergy among EU policies, the study will analyse the current challenges to the ways in which the EU is promoting the rule of law in Kosovo. Based on the critical analysis of EU documents and the academic literature, as well as semi-structured interviews with EU officials in Brussels and Kosovo, this paper questions whether the introduction of the High Representative and the creation of the EEAS improved the coherence of EU involvement in Kosovo, especially in the field of rule of law assistance. BOOK REVIEW. Gabriela Horoşanu. 2014. NATO-EU: A Smarter Collaboration, Bucharest, Tritonic Publishing House, 194 p, ISBN: 978-606-8571-41-6. BOOK REVIEW. Dan D. Lazea. 2014. Suveranitatea statelor si integrarea europeana a Balcanilor: cazul Serbiei (The Sovereignty of States and the European Integration of the Balkans: The case of Serbia), Timișoara, Western University Publishing House, 257p, ISBN: 978-973-125-440-1. BOOK REVIEW. Miruna Troncotă. 2014. Bosnia and Herzegovina: A Critical Case Study of Europeanization, Bucharest, Tritonic Publishing House, 327p, ISBN: 978-606-8571-36-2. After the latest European electoral cycle, right wing parties on the far side of the political spectrum along with right-wing euro-sceptics and conservative anti-federalists won 112 seats. The presence of the radical right in the European Parliament (EP), has often been attributed to the second order election model theorised by Reif and Schmitt (1980). In European elections, turnout is traditionally lower compared to “first” order national elections, parties in government tend to lose vote-shares while smaller parties benefit from the European system of proportional representation. This article analyses the relationship between radical parties and the EP by examining the French and Danish results in the 2014 elections. Though both constitute the third political force in their countries at that time, Front National and Dansk Folkeparti’s electoral support is representative of a second order election. The former party benefited from a classic sanction vote while the second one owes its breakthrough to a particular Danish voting behaviour, somewhat singular in the European Union. The article offers an in-depth overview of the literature on both the radical right, the Second Order Election model as well as radical right parties’ dynamic at the European Parliament level. Through the European Neighbourhood Policy (ENP), the European Union aimed at offering a stable framework for the development of its neighbouring countries. The Eastern dimension of this policy, the Eastern Partnership, proved to be the catalyst for an unprecedented internal wave of protests. Ukraine, probably the most demanding country in the ENP, has posed a great challenge to this framework. In this article I offer an analysis of those events from the perspective of the EU to show that the factors for these surprising events are rooted in Ukraine’s internal structure. As the conflict in Ukraine is still ongoing at the moment of writing, I complete my analysis with the Minsk 2 agreements. My argument is that the aim to get close to the EU has been motivated by Ukraine’s desire to obtain a political system based on good governance, which was at the same time another goal. I explain the desire to sign the Association Agreement and the deepening of relations with the EU as attempts to ensure that the country would not transform its internal political regime in order to look more like the Russian Federation. The present paper aims to portray a clear perspective of the problem of immigrants, who are arriving in Europe from the Middle East conflict zones (particularly Syria and Iraq) and from North Africa (mainly Libya). The causes that conducted to the development of such a phenomenon represent the motivation for choosing this theme, as well as its effects on the functionality of the EU at an institutional level and finally yet importantly the “trenchant” visions of the European public opinion, amplified by the mass media: the pros and cons of accepting the wave of refugees. The author’s approach aims to put in balance both the positive effects of the phenomenon on the European continent, as well as the negative ones. Positive effects might consist in obtaining additional work force, as Europe is currently facing a demographic aging phenomenon. Furthermore, from the perspective of EU citizens, who believe in the cohesion of the European institutions, the acceptance of refugees represents a basic value for unity and further on stands for the formation of a homogenous European Union, therefore emphasising the importance of each individual. On the other hand, analysing the matter in the most realistic possible way, the risk of potential terrorist penetration in Europe is quite high and unmanageable. As a research method, we will use document analysis, referring to media articles and official documents. This phenomenon is particularly complex and the crisis result will depend on the effectiveness of the manner in which each national authority as well as the European ones will handle the issue. Carl Clausewitz’s main book, “On War”, suffered from its inception continued misinterpretations and distortions, compounded by the frequent opacity of the text itself. One of the most damaging such misinterpretations has probably been the one suggested by Paul Wolfowitz in the framework of the so-called “Wolfowitz Doctrine”. The primary objective of the present note is to demystify the situation and to correct the main points of incoherence, in order to contribute to a more accurate interpretation of Clausewitz’s thinking. We identify first the main characteristics of “On War” including its implicit moral dimension, and subsequently examine the main areas of incoherence in Wolfowitz’s interpretation, among which the excessively ambitious definition of “minimum objectives” originated in an erroneous understanding of the concept of “Total War”. As a result, we see that this latter misinterpretation frontally clashes against what is most likely Clausewitz’s main thesis, i.e. War as a Rational act. War is a political act and as such is part of a dynamic in which decisions must be taken considering their likely effects, in order to reach the optimal outcome. Given that armed conflicts invariably produce damaging, undesirable losses, preventing them and limiting their scope and duration are obvious demands of rational decision-making, clearly implied in Clausewitz’s work. Limitation of war is thus a desirable, appropriate, necessary and efficient objective, contrary to the Wolfowitz’s misinterpretation, which needs urgent correction. BOOK REVIEW. The Romanian Journal of European Affairs, Vol. 15, No.3, September 2015, 95 pages. ISSN print: 1582-8271, ISSN online: 1841-4273.